Recycling crafts are a passion of mine but boy did I struggle for ideas recently when I had to come up with a kids recycled craft ! 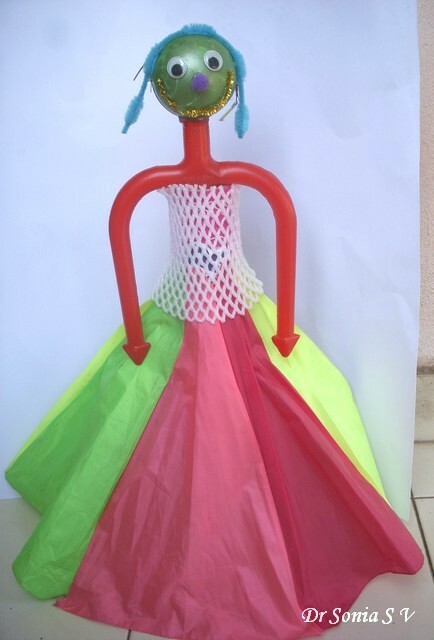 My 5 year old has a week long exhibition in school on recycling crafts-- sounds easy ??? Well the catch is the kids have to take the material from home and assemble it themselves in the school in the time given to them ! I shuddered at the thought of sending scissors and glue to school . 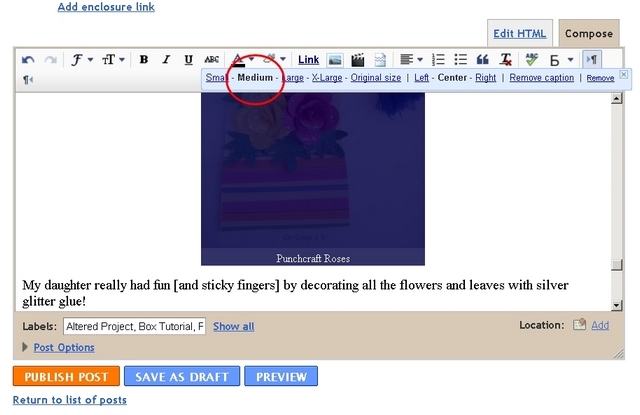 What if she smeared glue all over her project or worse what if she hurt herself with the scissors ?? 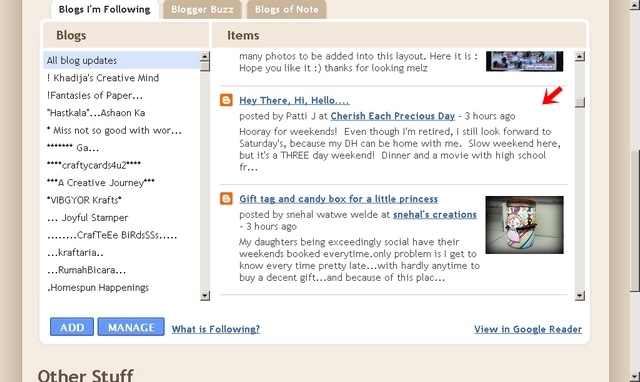 [like many mothers I am a bit paranoid where my precious bundle is concerned!]. 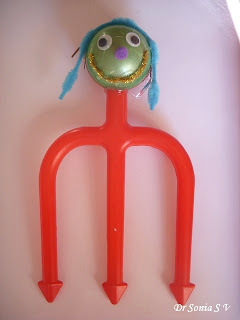 My daughter herself solved my problem- she invented her own recycled craft ! 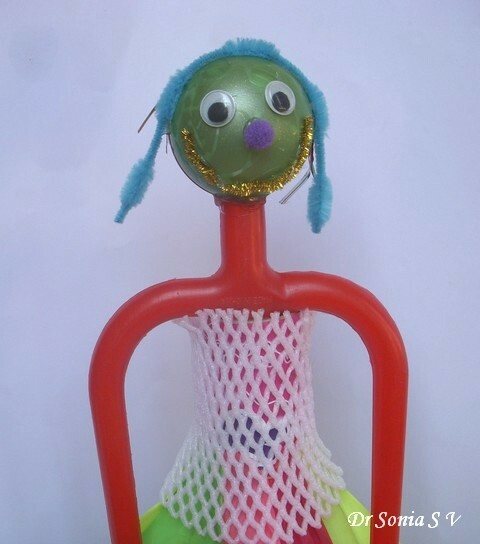 I saw her balancing a ball atop a broken toy part which she had inserted inside the cardboard tube of an used party popper - she had made a dancing doll! 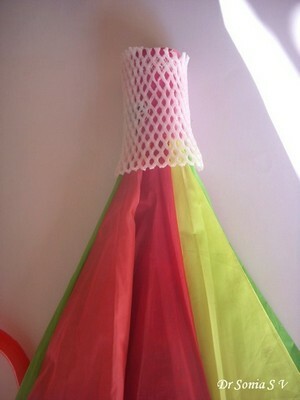 I helped make a frock for her doll and we had a cute recycled dancing doll! These are the materials we recycled to make our recycled doll. 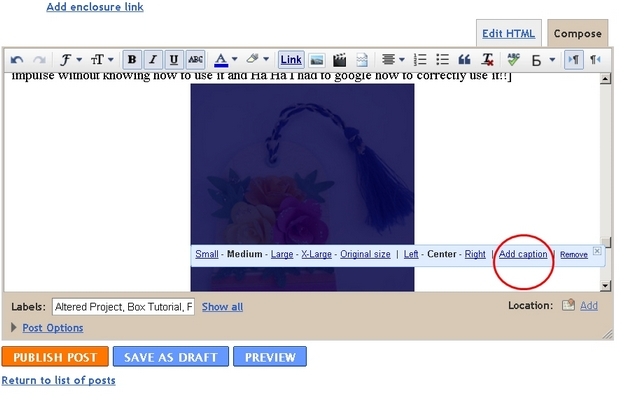 Gems Ball Container- Useful ball shaped one that is so good for recycling crafts. Broken Umbrella - I have quite a few broken umbrellas at home! Fruit cover netting - Apples and pears have these lovely thermocol/styrofoam net covers these days. 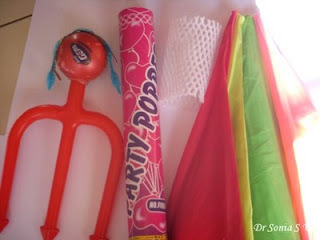 Party popper -a used one .I wondered myself why I was crazy enough to have saved it! I stuck the gems ball on the top of her broken trident using the glue gun [the glue gun is the best tool a mom could have!! ].My little one designed the face and hair-- kids have weird color ideas and she wanted her doll to have a green face, blue hair and a purple nose! The blue hair is a pipe stem cleaner [ chenille stick].I plan to send this top part as such for her recycling craft. 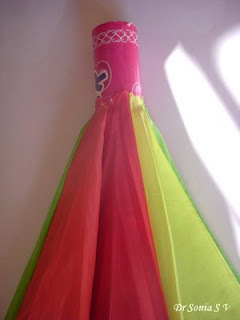 I cut off the fabric from the umbrella and it left just a small hole in the top part.Taught my little one to slide it down the party popper cardboard tube to help make the skirt of her recycled craft doll. Next she just had to slide down the fruit cover net to make the blouse of the doll.The fruit cover net is so springy that it stays snugly in place like a real blouse!Here is the dress of our recycled craft doll. Next just insert the middle prong of the trident into the cardboard tube of the party popper and you have a doll which dances as the top part is not fixed but is free to swing to and fro! The party popper we used has a weighted base so if you are making a similar doll with a bottle or other container weigh down the bottom as otherwise your doll will topple over when she dances.I hope you enjoyed reading about this kids recycling craft! I have dismantled this doll and packed the parts for my little one to take to school tomorrow . As this was simple for her to make, I am also sending her a cardboard box castle to make.Will share pics of that later.Keeping my fingers crossed all goes well tomorrow at her recycling exhibition. 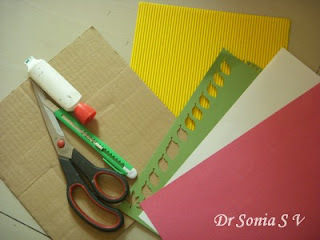 Do share your thoughts on this recycling craft. 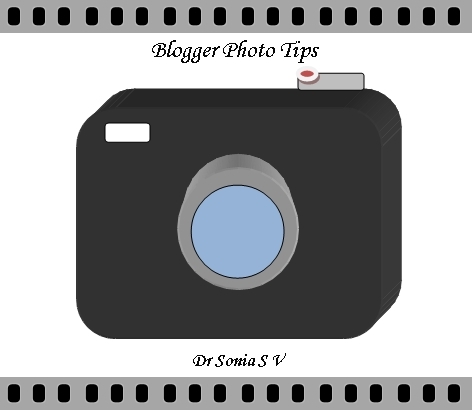 Pop Up card making is fun and not that complicated once you master a few tricks.Sharing a small tip or trick to make a pop up card more gorgeous ! This Santa Claus Card is a recycled card. 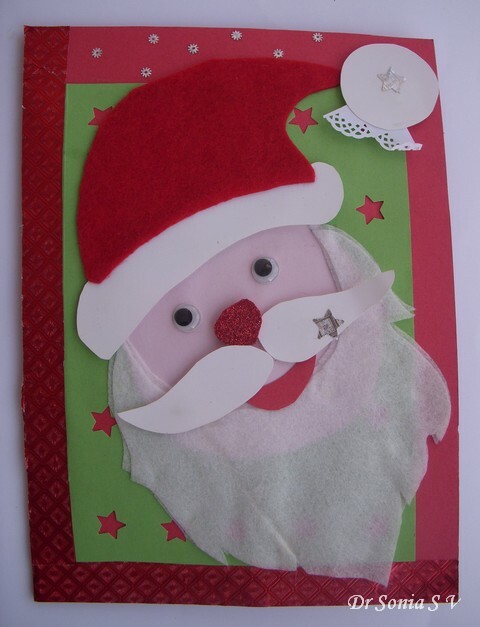 The Santa on the front of the card has been pieced together from paper scraps ,felt and tissue paper! 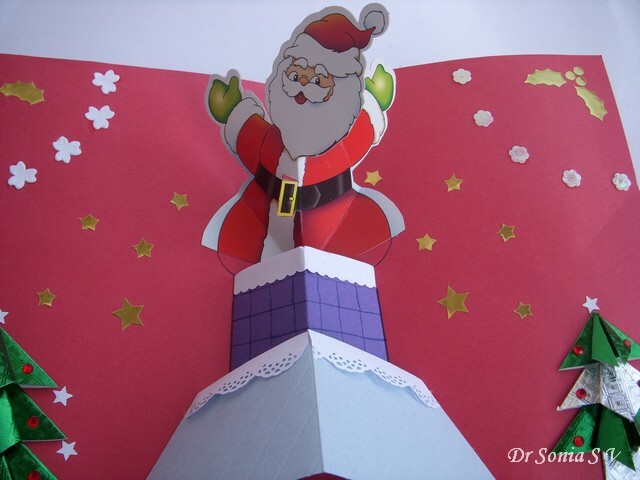 I made Santa Claus pop up from a chimney on the inside of the Pop Up Card. 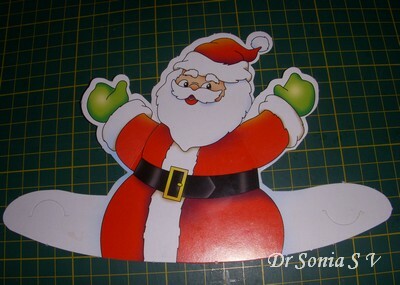 I recycled a Santa Claus image to create my pop up card. 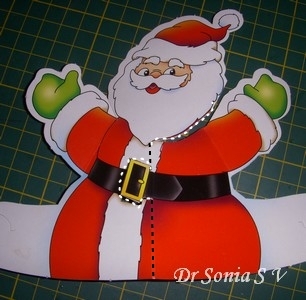 The problem with this simple pop up card construction is it would make the central fold line run through Santa's face and poor Santa would look a bit cramped! 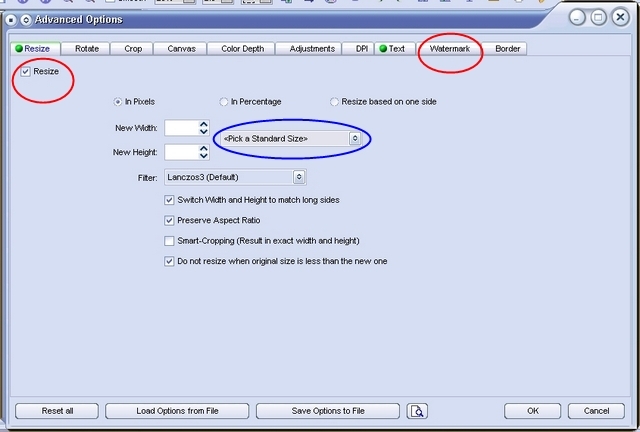 Decide on your central fold line [shown as a black dotted line] but dont crease it just yet. 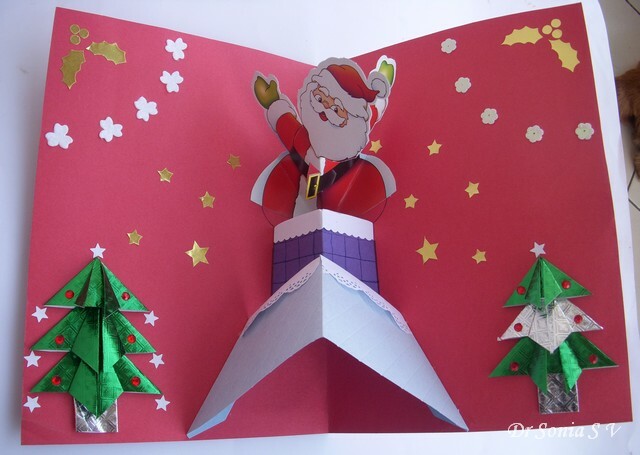 Now score and mountain fold your central fold [ black dotted line], valley fold the lower part and glue the lower part .You have a fun Santa Pop Up card! 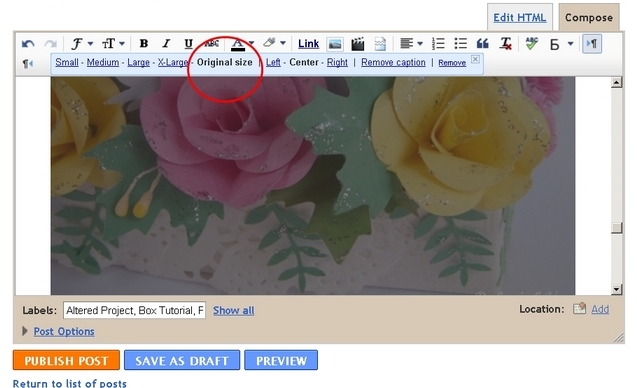 You can adapt this trick to make any pop up card more special! Do tell me how you like this fun card. 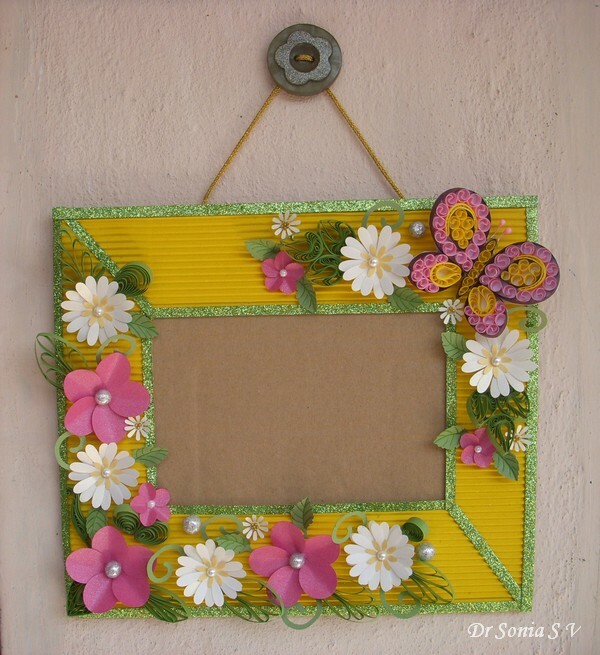 I made a handmade photoframe by recycling a cardboard piece from a box.I love making paper flowers- they are so easy to make and add so much beauty to your projects. Here is the link to how to make a DIY Handmade Photoframe. 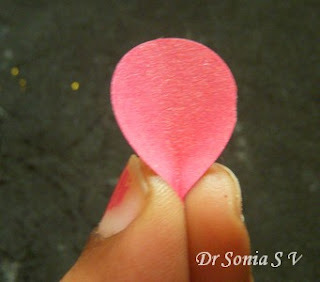 I love to transform mundane objects and if it involves recycling it makes it all the more exciting! 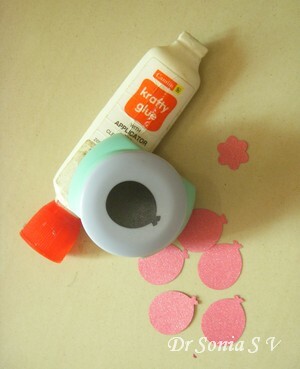 This photo shows the cardboard and papers I used to make the photoframe and paper flowers. 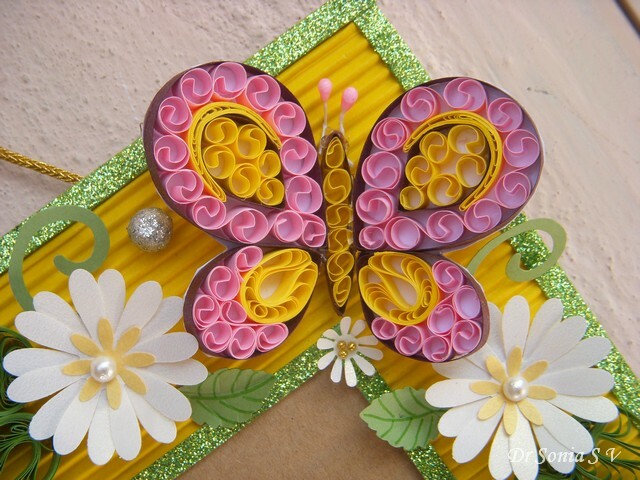 Closeup of my quilled butterfly inspired my my blogger pal Mihaela. 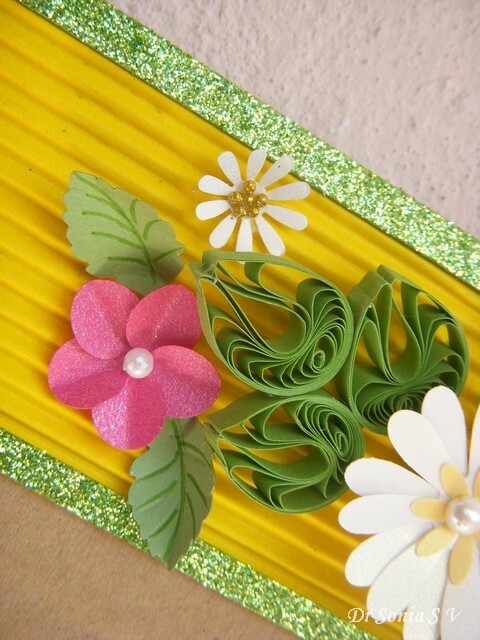 The white daisies are punchcraft paper flowers. I used punched balloon shaped petals to make the large pink paper flowers on the cardboard photoframe. 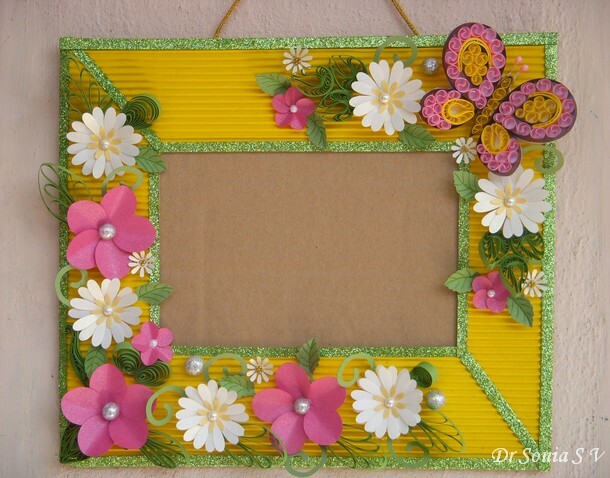 All the paper flowers in this photoframe are easy to make but I always feel that if you see the steps to make something,making it gets even more simple.So sharing some simple steps and tips to make the paper flower. 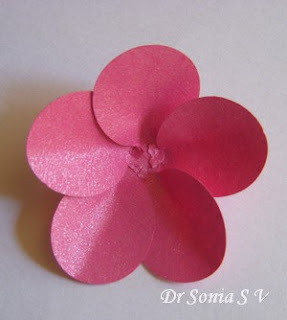 This Paper flower can be made with the circle,oval ,tear drop or balloon shape. 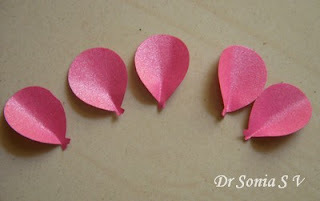 I used the balloon punch to make these punchcraft paper flowers. Lightly emboss a circle,sun ,small flower or even a scrap of paper to form a cup shaped base for your paper flower. 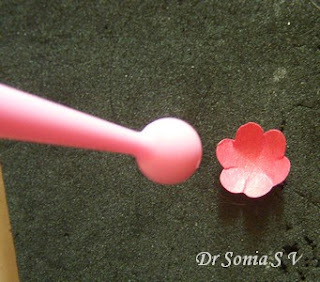 You need just 5-6 petals to make your paper flower. 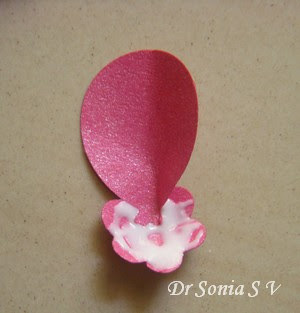 You can apply glue to the folded tip of your petal or onto the cupped base as I did here on my paper flower. Here is the finished paper flower. 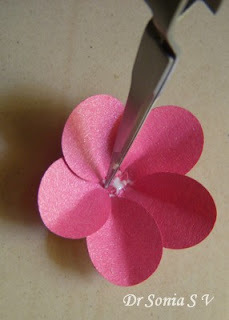 The smaller pink paper flower is made from circles.Here is the tutorial link : how to make Circle Paper flowers. 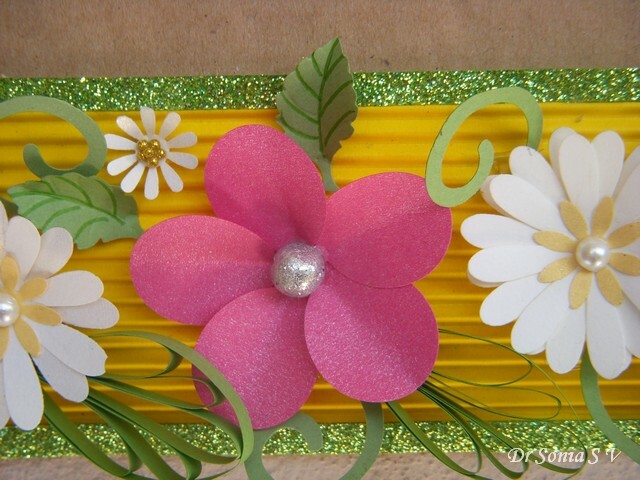 I stuck some quilled leaf shapes to make a large leaf for my paper daisy.Here is the link to :how I made the quilled leaf shape.Added some Pie Lane glitter balls to glamorize the white punched flower. I recycled some cord and an old button by threading the gold cord through the button and attaching it to my photoframe.